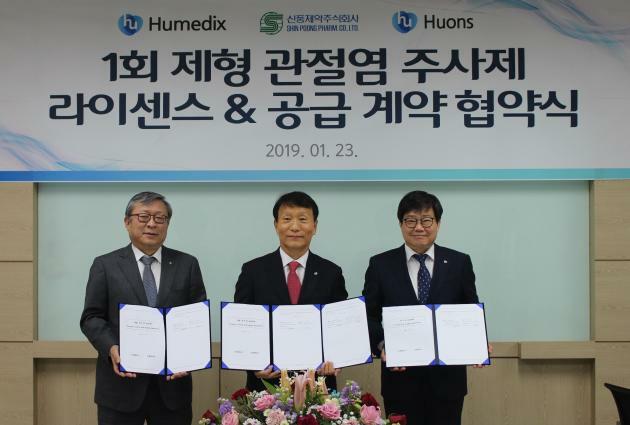 From left, Shin Poong Pharmaceutical CEO Yoo Jae-man, Humedix CEO Chung Koo-wan and Huons CEO Um Key-an hold up their agreements at Humedix headquarters in Anyang, Gyeonggi Province, on Wednesday. Humia is a once-a-month osteoarthritis treatment jointly developed by Humedix and Shin Poong. The two companies completed phase 3 clinical trials in April last year, proving that the drug’s efficacy continues for about six months with only one administration. Huons and Shin Poong plan to market the drug in the first half of this year after obtaining approval. Shin Poong will sell the drug under the name Hyaloneshot. Humedix, which has already entered the osteoarthritis drug market with Highhyal Plus and Airon injections, plans to emphasize the convenience of Humia’s improved usage and capacity. Huons and Shin Poong intend to make the most of their extensive distribution and sales network to promote the sales of Humia. Huons for its part will aggressively knock on the global osteoarthritis drug market based on its know-how and experience in overseas market entry, and will expand its target market mainly in Southeast Asia and South American countries such as Vietnam and Mexico. The company also plans to hold detailed discussions with leading pharmaceutical companies in the U.S., Europe and the Middle East. “We will do our utmost to ensure that Humia is positioned as a representative product in the osteoarthritis drug market through the solid domestic and overseas distribution networks,” Humedix CEO Chung Koo-wan said.